Fully Customized for your special day! Our custom made wedding coasters are packed to enjoy during the wedding, and as souvenirs for you and your guests on this very special of occasions. Set your reception table with these beautiful and memorable keepsake coasters, customized with full colour on both sides. You can put a photo of the newlyweds on your coasters along with the date of the wedding on one side, and another photo or a special written message on the back for your guests to remember this day by. Get your coasters in 3 simple steps! Step 1: Give us a picture. 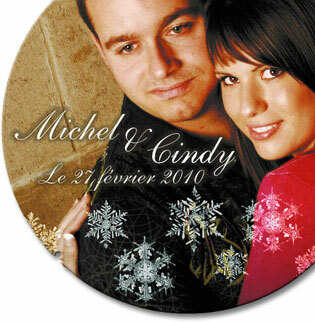 Provide our graphic team with an image to use for your wedding coaster. Our skilled designers will create an attractive design of your coaster to proper specifications and prepare a proof. Step 2: Approve the proof. Once you have the proof, you can work with our graphics department so that your piece is designed just as you imagined, or even better! Then, give us the go ahead and we will print your coasters! Step 3: Enjoy with family and friends! Share your custom made wedding coasters! Use them at a shower, or on the day of the wedding, providing small packs of coasters to your guests to remember your special day.